We should boycot Ethiopian Airlines, a symbol of betrayal and racism. Ethiopian Airlines use only Amharic music even though the country is multi-ethnic. They paly Amhara music with Amhara themes. They speak only Amharic even though most of the passengers are foreigners and do not understand amharic. For non-Amhara Ethiopian like myself, I found it disturbing to hear only Amharic music. All Ethnic groups should have their music played in the carrier or decalres itself "Amhara Airlines". Most of the hostesses are from Guraghe, Oromo, Tigray and Eritrea. I have not seen a Somali or Afari hostesses. Maybe Somali and Afar Ethiopians are less interested in becoming hostesses. I was surprised that there are many Eritrean hostesses, which were arrogant when they were serving Ethiopian passengers. By the way Ethiopian Airlines has been employing Eritreans, even when Eritrea was at war with Ethiopia. TPLF employed eritreans in Mekelle Ticket Offices ( God knows why as there are many Ethiopians who could do the jb better than the eritreans). Ethiopian Airlines is employing about 17000 ethiopians we are told. And yet Ethiopian passengers are maltreated and the atmosphere when one is in the airplane is more like being in ethnic war ( imagine an Oromo or Galla hostess trying to be more friendly to Africans than Tigrayans or Amhara or an Eritrean hostess trying to bring into trouble some Tigrayan passengers - this has happened). The Ethiopian airlines is not serving international flights to Awassa, Mekele or Bahirdar. You have first to fly to Addis Ababa to go to Jijjiga or Awassa or Mekellee. This is time consuming and a wast of a day or more, which has a disadvantage for those who are professionals or businessmen. It decreases also interest to travel with the airline. We need to boycot Ethiopian airline as it is not serving Ethiopian people's interest. It is a self-serving greedy company with anti-Ethiopia agenda. To hell with it ! Ethiopian Airlines maltreats Ethiopian passengers becaue they are planning to serve non-Ethiopians. They paln to exapnd internationaly, eyeing 1.3 billion Chinese, who might travel to Africa for business and pleasure. For Ethiopian passengers, we need to encouage Lufthanasa and other European carriers to to fly to the Awassa, Jijjiga or Mekelle or Bahir Dar. Ethiopian Airlines, is a company with no Ethiopian agenda. It underdevelops regional capital cities by purposely not allowing international flights. Air flight is goos as long as it save time. Who would one give 2 days of one's life to reach a destination. Mekelle is interesting for many European traellers becuase of historical sites ( old churches, Aksum oblisque etc) are close to Mekelle. It is safe to make business in Mekelle.A direct flight to Mekelle or Bahirdar ( is also sfe) or Awsa or Jijiga should the priority of Ethiopian (Amhara) Airlines. But this has not been the case the company does not have any vision for development of Ethiopia's air travel. The airline is acting as an anti-Ethiopia company interested only in exapnding in other countries, but which finally lead to it being bankrupt. Ethiopian Airlines is a sham company. It is the negation of any thing Ethiopian. It employs foreign pilots and pays them twice or more than Ethiopian pilots. This is ridiculous and unconstitutional. Ethiopian Airines a pilot from Ghana or Nigeria twice as much as an Ethiopian. we are told. Why does this happen? Do they fly better than Ethiopians? Ethiopian pilots are emloyed in USA and other countries with equal pay with their American counter parts. We should not allow such things to happen. We should to justice the managers of the Ethiopian Airlines. The people of Ethiopia should actions against such unjust practices as they are demeaning and will be dicouraging our youth who takes reaponsibility of the country in the future. We should force the Ethiopian Airlines to give priority to our regional capital cities than invest in Zambia, Nigeria or Central Africa. Our citizens in all regional states are more important than nigerians or zambians. Ethiopia should prioritise the need of it's own population than help other african countries to have their airlines started or managed. Why does this happen to Ethiopians? The leaders are greedy and selfish. We should force our own way. The ethiopian elites are mentally slaves and do not identify themselves with interest of the people of Ethiopia. This should change as it affect the next generation and generations after that. Firts ethiopians, then foreigners! Tigray needs 10 billion dollars and good leaders to start with,where do get that money,first give the government to able people and there is less problem.Why do you always see at the dark side,I have no respect for people who hide themselves and talk all the nonesense.Enteketeluni ewn,I have no regret,sle hezbey tezaribe eye. The Ethiopian people should benefit from any company that is financed through their money, as is Ethiopian Airlines. I raise the problems to get a solution. If the company is not working for Ethiopians, then it has to disappear. We can do that by boycotting their services and bringing the mangers to justice for underdeveloping air travel in Ethiopia by asking too much money for a simple air travel lasting an hour. The Ethiopian Airlines cannot just exploit the ethiopian people in the name of their national flag and carrier. They are self-serving idiots. They have no vision for Ethiopia's domestic air travel which they see them as less imprtant than travelling to Brazil or where ever they go. The aim should be to facilitate the life of Ethiopians. Why is an Ethiopian less important than a Zambian or some body from Benin? Why does Ethiopan Airlines invest in Nigeria or Benin and not in Jijiga, a cpital of the Somali population in Ethiopia or Awasa? As to Tigray, it needs to work further to develop it's economy and the Mekelle airport should get direct flights from major cities internationally. We should be able to fly from New York to Mekelle or from London to Mekelle or from Peking to Mekelle or from Ryiad to Mekell or from Cairo to Mekelle etc. This could be done by private investors founding an internatinal airline that could be based in Mekelle. Mekele would need to have it's own hangar and also a staff training centre. 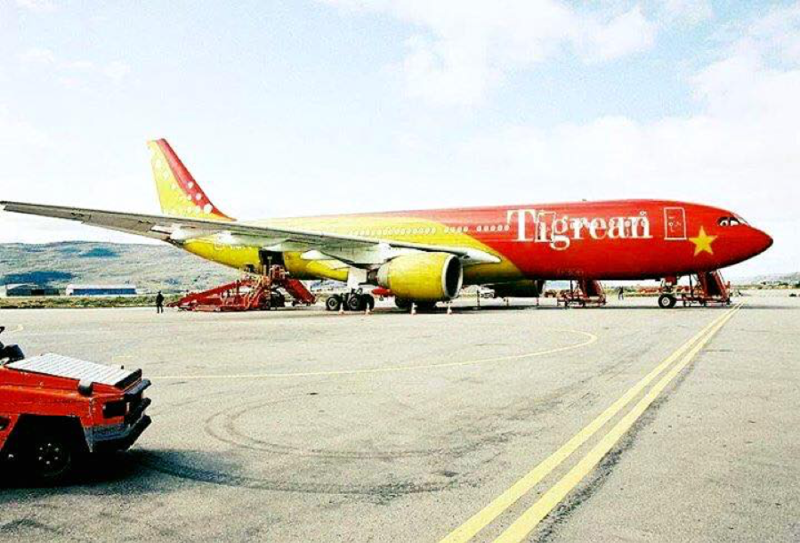 Tigray looses a huge amount of money by not having intrenational air travel services. There will be more hotels to be built and many youth could get employed. Inferiority complex on display for everyone to see. Chigaram dumborat, you will always be beneath our shoe sole.